Maruti Suzuki proclaimed LUV (Life Utility Vehicle) Maruti Ertiga has written its own success story. We have followed the Maruti Suzuki Ertiga from its concept car development stage as Maruti R3 to its comparison with the rivals. Ertiga has proved to be a successful car in a very short while with its high value for money quotient and huge demand. But Maruti Suzuki in India has been facing a lot of problems regarding various offerings from tine to time. When the company launched the new Maruti Swift 2011 the workers went on strike and it took Maruti Suzuki lots of time and efforts to bring the production back on track and now it’s Ertiga which is under the dark clouds of prolonged waiting period due to already heavy bookings and to add to it further there is shortage of alloy wheels for the top end variants. 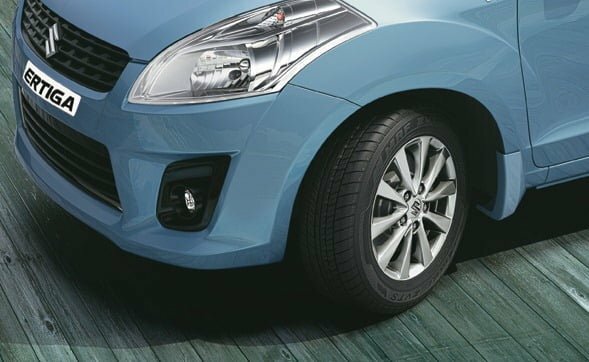 Maruti Suzuki Ertiga offer alloy wheels only on its top end variants that is Zxi (petrol variant) and Zdi (diesel variant) and now the news has arrived that these two variants are under the pressure point due to the shortage of alloy wheel and counts a waiting period of about 3 months and nine months respectively. Since these alloy wheels are sourced from an international supplier who is facing problems to keep up with the present demand and there is a shortage of the alloy wheels. Due to rise in prices of petrol Ertiga’s diesel variant demand counts 70% of the total sales with the top end ZDi bringing about 20% of the total sales. The Ertiga diesel version of this car is powered by Fiat‘s 1.3 litre Multijet engine and return an overall mileage of 18.6 km/l on the diesel variant which makes it a very low running cost car. Feature list on Ertiga is quite decent on all the variants, on its top end Zdi and Zxi its offers two airbags, fog lamps, ABS, EBD, Steering mounted control, Tinted glass, rear AC vents, defogger etc. to name a few. The car is based on extended Suzuki Swift platform and the exteriors give it a complete family car look. In India Maruti Suzuki Ertiga competes with some popular and larger MPVs like Mahindra Xylo, Toyota Innova, Tata Safari Grande and has made the rivals scratch their heads. The Ertiga is priced between Rs. 6 Lakhs to Rs. 8.5 lakhs, with such competitive price and more demand for top end variant of both petrol and diesel. Maruti Suzuki will have to come out with a solution soon before the situation gets worse. We will keep you posted on the same, stay tuned.